This article is a short summary of Mario Golf: Toadstool Tour. 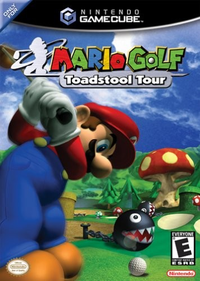 Mario Golf: Toadstool Tour is a golf simulation for the Nintendo GameCube and the third installment of the Mario Golf series. "Mario, Peach, Yoshi, Donkey Kong, and others have tee times reserved in the Mushroom Kingdom! Challenge them to tournaments, or take them on in character matches to collect rings or nab coins! Play on resort-style courses or look out for Chain Chomps, Warp Pipes, and Thwomps on the Mushroom Kingdom courses!"